Shut down your computer. Open up the side of your computer, unplug the ribbon cable and power cable from the drive that you are pulling out, remove the screws holding the drive, and pull it out. Now, look at how the jumper is set on the pins on the back of the existing drive, and put the jumper the same way on the new drive. Put the drive in your computer, connect the ribbon cable and power cable, put the side back on the computer case, and boot up. Forgot the sound cord, Bruce ... but it is unplugged and replugged the same as the ribbon cable and power cable. With most motherboards and XP, the sound cord is an antique item and has not been needed for a long time. before you can use LightScribe functionality, you have to install the LS-driver wich normaly comes along with your drive. wich will give you the choice for more contrast on your labels. You might get something from here. Take a look at Bruce's post again regarding seeing how your other drives is pinned (i.e. master, slave etc.) If you still want your other drive to be what it was set at, then make your new drive a different setting. In other words make one or the other the master and the other the slave. Other than that follow Burces basically install and you should be O.K. Agreed. When I put the first burner in the Win98 SE, I was told make one the master and the other the slave - it doesn't matter which is which. Generally, the more powerful drive should be master and the other slave, but if it's hard to get to the jumper, just make sure they are different - which is why the burner became the slave while the CD-ROM stayed master. Or, if it is set on Cable Select, set them both to Cable Select. This assumes they are on the same line. If on different ribbon cables (which can be done with a large case), then they would both be master - when looking at the BIOS (which is a lesson for some other day) they would show up as primary master and secondary master, and stay out of each other's way. Sorry, but Lyn is not a hardware guru and that is very bad advice. A user should NEVER put two drives set to CS on the same cable unless he/she is certain the cable is specially configured for that purpose. 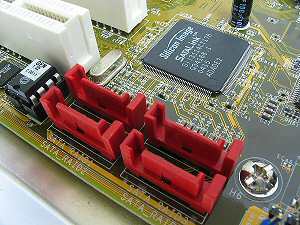 A single drive will run okay on a standard 40-pin IDE cable whether set to MA, SL, or CS and for this reason a proportion of lazy computer assemblers will configure a solo drive as CS. However if you find a solo drive set to CS it doesn't mean the cable is specially configured, and if you put two drives set to CS on a standard cable both drives will configure themselves as "master", causing a configuration conflict. If you have a solo drive set to CS in your system, check the cable carefully before you add another CS drive. Did your computer come with a MANUAL? Most have them in either printed versions or on the computer hard drive. If not, check the website of your computer manufacturer. Most companies have them online. That would be your best guide as to how to put in an additional drive. It will explain which cables to use and what settings you need. Okay, I have to play devil's advocate here for a little bit. Some questions that have not been asked yet. First, it was not mentioned whether this is an internal or external drive. Big difference. Second, if internal, it could be either IDE or SATA. Many nowadays are SATA, which probably will become the standard before too long. Does "configuration" involve more than just having an 80-pin cable? Does it involve things that would not be visible? And marlinsinger - does where the plug for a SATA look different from an IDE, or how does one tell them apart? The computers I work with about 6 hours a week are OLD computers, we are now beginning to see a fair sprinkling of P4's, but mostly still PIII's. At this point PII's go directly to deconstruction, just like non-working computers. Lynn, SATA is a much thinner cable and I've only seen them in red as well as the port on the MB. These are very, very easy to plug in and when you lots of SATA devices (3 hard drives and 2 DVD drives) the decrease in cable size helps air flow and keeps the computer cooler. Here's what they look like on the MB. I've only seen boards with 6 ports so far but I would assume that number may change as they become the norm. There are no 80 pin IDE cables, 40 pin 40 wire and the newer 40 pin 80 wire Ultra DMA IDE cable. The connections (the 'L' bit) are the same but the headers on the mobo are usually red or black, depending on whether it's SATA 1 or 2). 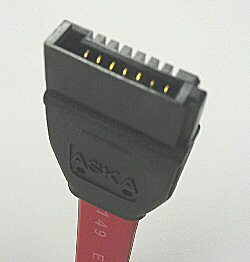 SATA connectors are totally different, both power and connectivity. Although many have legacy power connectors, some do not. Also ther is no jumper. No such thing as slave, master, or cable select. Some decent pictures of the connectors here. Just like many MBs do not have floppy connectors any more, I expect before too ling, the IDE connectors will disappear. Boy, I hope that after all this discussion I hope the OP "rrangel" gets the drive installed and running O.K. Okay... just to be contrary as well, I've seen some systems that would not work with a single IDE drive on a cable that was set to be the Slave, with no Master. I doubt that any reasonably current systems are like that, but you never know. I have seen that even on newer systems. If set to slave and it is plugged into the end connector, it will not work. Speaking of exceptions and wandering off the subject of optical drives to Hard Drives, having had an unintentional review yesterday - Western Digital drives are set differently for single than for Master if there is no slave present. Otherwise they run like they have molassass in the works. Ken was doing orientation for newbies at the time, so wasn't around for the demo. But he indicated that at some point WD came around and started doing it like everyone else - and there is a problem if you do it the other way. But fortunately, Optical Drives all have he same settings (all I've seen, anyway) - with Hard Drives, hope you can find a graphic of some kind on the drive to get the info from.